We knew a right whale survey on Jordan Basin in December was going to be a challenge. For the last three weeks, the days have been getting shorter and the storm systems stronger. And as the shortest day of the year was approaching giving us only 9 hours of daylight, our hope for calm weather was fading. Then a glimmer of a break in the weather appeared for Saturday, December 18. The back to back storm systems that had been hurtling across the country and along the eastern seaboard bringing high winds and precipitation for days on end were slowed by a high pressure system coming down from Quebec. Saturday's forecast and predicted wave heights were the best we were going to get for awhile but would it be good enough to carry out our survey effort? On Friday morning we made the decision to go for it and by 1 pm the truck was loaded and we were on our way from Boston to Bar Harbor, ME. Despite a slight increase in wind and waves on the Saturday morning forecast we decided to at least poke our heads out at 4:30 am. The land temperature was in the teens and there was several inches of snow on the ground. The boat's crew helped our team of six and a cadre of local volunteers load our gear and ourselves onto the snowy deck and into the cabin before heading offshore through a low cloud of sea smoke hovering above the water. 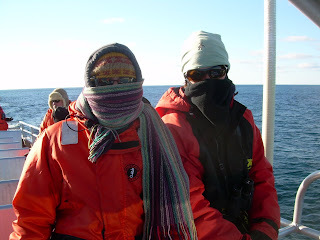 By 7 am we had reached our survey area and there was just enough light to begin looking for telltale whale blows. The air temp was a balmy 25 degrees, and we decided to rotate our watch every 30 minutes to keep warm and alert. Even just 30 minutes on the top deck exposed to the full brunt of the wind on a vessel travelling 10-14 knots was bitterly cold, the wind chill was in the teens and in the frostbite zone on the windchill index. With many sets of eyes looking near and far, several blows were seen miles away shortly after sunrise but they proved to be fin whales. We set off on our tracklines. 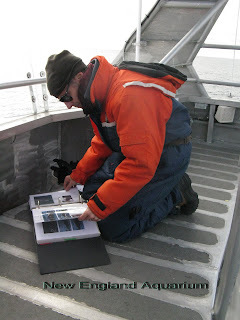 Many hours of surveying yielded about a dozen fin whales and a few minke whales. 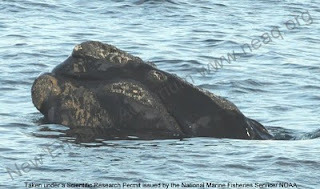 Finally two right whales, almost in the middle of the survey area. Once again, they were cryptic in their movements and challenging to photograph. But we were able to obtain id photos and continued our survey. But the second shortest day of the year proved to be just a little too short. Just at dusk we spotted three right whales, one of them breaching repeatedly. We adjusted our cameras to try an squeeze a little more light out of the day, but by the time we were able to get close enough to photograph, it was just too dark. We could still see the animal breaching through night vision goggles. However, we were left with a beautiful image in our mind's eye of a breaching right whale set against a back drop of the last tendrils of light from a beautiful sunset. Once darkness fell, the captain headed us for home transiting slowly through the right whale area before picking up speed. 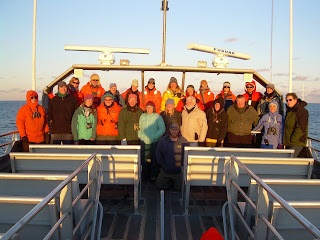 We compiled our data and shared our findings with the volunteers aboard (who were also collecting bird data). 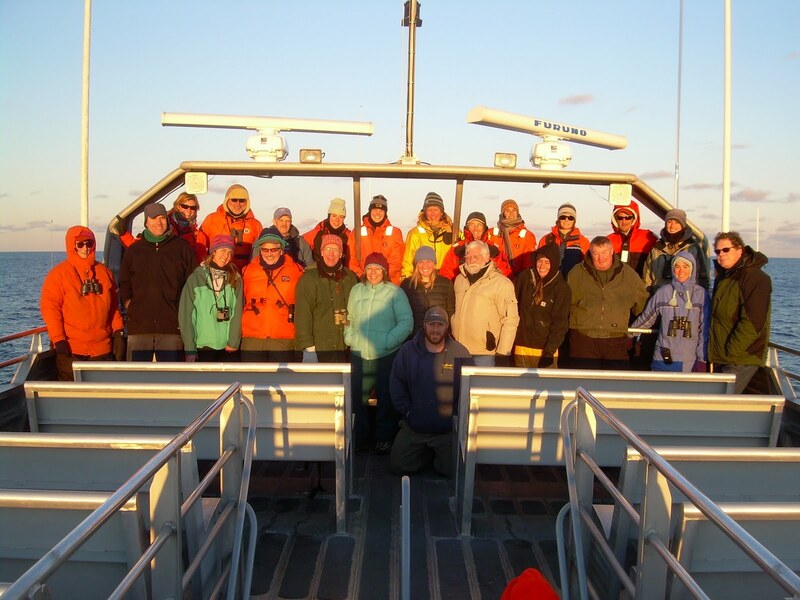 Despite many sightings of both birds and cetaceans, the general consensus was that counts and species of birds were lower than previous trips and right whales were harder to come by. We did learn that our colleagues at the National Marine Fisheries Service had conducted an aerial survey this same day to our south and west and had found at least 28 right whales including a large surface active group in an area called Cashes Ledge. It may be that the purported mating ground covers a much broader area of the Gulf of Maine than previous surveys had indicated. We were back at the dock by around 7:30 pm exhausted but happy that the weather gave us the opportunity to brave the cold and once again witness the Gulf of Maine under cover of winter. We have one trip left that will take place in January. Happy Holidays to all our followers and best wishes for a healthy and adventure filled 2011!